Acute homeopathic prescribing is that part of homeopathy that treats illness of abrupt onset requiring immediate attention. In homeopathic medicine, acute refers primarily to the speed of onset and selflimiting character of the disorder rather than its seriousness. Colds, influenza, sore throats, insect stings, cuts, bruises, vomiting, diarrhea, fever, muscle aches, and short-term insomnia are all examples of conditions that are treated by acute prescribing. The remedies given in acute homeopathic prescribing are intended to stimulate the body’s internal ability to heal itself; they do not kill germs or suppress symptoms. Acute prescribing can be done—within limits—by patients at home, as well as by homeopathic practitioners. Study courses, self-treatment guides, and homeopathic home medicine kits are now available by mail order from homeopathic pharmacies and educational services. Homeopathy is a gentle, painless, holistic system of healing developed during the 1790s by Samuel Hahnemann, a German physician. Experimenting on himself with the anti-malarial drug quinine, Hahnemann noticed that large doses of the medicine actually caused malaria-like symptoms, while smaller doses cured the symptoms. Homeopathic remedies are almost always made from natural materials—plant, animal, or mineral substances—that have been treated to form mother tinctures or nonsoluble powders. Liquid extracts are then potentized, or increased in power, by a series of dilutions and succussions, or shakings. It is thought that succussion is necessary to transfer the energy of the natural substance to the solution. In addition, the potency of the remedy is regarded as increasing with each dilution. Proponents of homeopathy over the years have included Louisa May Alcott, Charles Dickens, Benjamin Disraeli, Johann Wolfgang Goethe, Nathaniel Hawthorne, William James, Henry Wadsworth Longfellow, Pope Pius X, John D. Rockefeller, Harriet Beecher Stowe, William Thackeray, Daniel Webster, and W. B. Yeats. England’s royal family has employed homeopathic practitioners since the 1830s. Its nontoxicity makes it a good choice for the treatment of children. Another benefit of homeopathy is the cost of treatments; homeopathic remedies are inexpensive, often a fraction of the cost of conventional drugs. Acute homeopathic prescribing is thought to benefit a wide range of ailments. These include altitude sickness, Bell’s palsy, the common cold, allergies, coughing, dengue fever, dysentery, earaches, migraine headaches, fever, food poisoning, grief, influenza, motion sickness, shock, sore throat, surgical complications, and reactions to vaccinations and drug therapy. Acute remedies may also be prescribed for treat insect stings, animal bites, and problems related to poison oak and poison ivy. Homeopathy may be further employed in treating injuries including black eyes, burns, bruises, concussions, cuts, damaged tendons and ligaments, dislocations, fractures, herniated discs, nosebleeds, puncture wounds, sprains, and strains. Homeopathic prescribing differs in general from allopathic medicine in its tailoring of remedies to the patient’s overall personality type and totality of symptoms, rather than to the disease. Whereas a conventional physician would prescribe the same medication or treatment regimen to all patients with the common cold, for example, a homeopathic practitioner would ask detailed questions about each patient’s symptoms and the modalities, or factors, that make them better or worse. As a result, the homeopath might prescribe six different remedies for six different patients with the same illness. In acute prescribing homeopathy, consultations are more brief compared to constitutional homeopathic prescribing. A typical patient might spend just 10–15 minutes with the practitioner, compared to more than an hour for constitutional prescribing. Peculiar symptoms. These are symptoms unique to the individual that do not occur in most persons with the acute disease. Homeopaths make note of peculiar symptoms because they often help to determine the remedy. Particular symptoms. Particular symptoms are localized in the body; they include such symptoms as nausea, skin rashes, headache, etc. 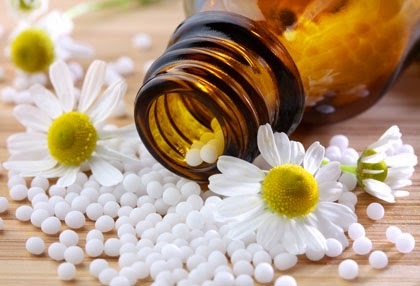 During homeopathic case-taking, the practitioner will evaluate the intensity of the patient’s symptoms, assess their depth within the patient’s body, note any peculiar symptoms, evaluate the modalities of each symptom, and make a list of key symptoms to guide the selection of the proper medicine. There are several hundred homeopathic remedies. Homeopathic medicines are usually formulated from diluted or triturated natural substances, including plants, minerals, or even venom from snakes or stinging insects. Some remedies may be given in a spray, ointment, or cream, but the most common forms of administration are liquid dilutions and two sizes of pellets, or cylindrical tablets (for triturated remedies). A dose consists of one drop of liquid; 10–20 small pellets; or 1–3 large pellets. Since the remedies are so dilute, the exact size of the dose is not of primary importance. The frequency of dosing is considered critical, however; patients are advised not to take further doses until the first has completed its effect. Homeopathic remedies can be kept indefinitely with proper handling. Proper handling includes storing the remedies in the original bottles and discarding them if they become contaminated by sunlight or other intense light; temperatures over 100°F (37.8°C); vapors from camphor, mothballs, or perfume; or from other homeopathic remedies being opened in the same room at the same time. The first step in acute prescribing is a lengthy interview with the patient, known as case-taking. In addition to noting the character, location, and severity of the patient’s symptoms, the homeopath will ask about their modalities. The modalities are the circumstances or factors (e.g., weather, time of day, body position, behavior or activity, etc.) that make the symptoms either better or worse. Case-taking can be done by the patient or a family member as well as by a homeopath. The choice of a specific remedy is guided by the patient’s total symptom profile rather than by the illness. Homeopathic remedies are prescribed according to the law of similars, which holds that a substance that produces specific symptoms in healthy people cures those symptoms in sick people when given in highly diluted forms. For example, a patient with influenza who is irritable, headachy, and suffering from joint or muscle pains is likely to be given bryonia (wild hops), because this plant extract would cause this symptom cluster in a healthy individual. Homeopathic acute prescribing is not recommended for the treatment of chronic conditions requiring constitutional prescribing, for severe infections requiring antibiotic treatment, or for conditions requiring major surgery. It is also not recommended for the treatment of mental health problems. Persons who are treating themselves with homeopathic remedies should follow professional guidelines regarding the limitations of home treatment. Most homeopathic home treatment guides include necessary information regarding symptoms and disorders that require professional attention. Homeopathic remedies may lose their potency if used at the same time as other products. Some homeopathic practitioners recommend the avoidance of mint and mentholated products (toothpastes, candies, chewing gum, mouth rinses), as well as camphor and camphorated products (including eucalyptus and Tiger Balm), patchouli and other essential oils, moth balls, strong perfumes, aftershaves, scented soaps, stress, x rays, coffee, nicotine, recreational drugs (marijuana) and certain therapeutic drugs (most notably cortisone and prednisone) during treatment. Patients are also advised to avoid electric blankets and dental work, as these are thought to adversely affect homeopathic therapy. Homeopathic remedies should never be placed near magnets. Practitioners caution that high-potency preparations should be used only under the supervision of a homeopathic practitioner. Homeopathic medicines are so diluted that sometimes no trace of the original substance can be detected. These medicines are therefore considered non-toxic and generally free of harmful side effects. There may, however, be individual reactions to homeopathic medicine. Aside from politics, part of the reason for this hostility is that there are some aspects of homeopathy which have not been completely explained scientifically. For instance, homeopaths have found that the more they dilute and succuss a remedy, the greater effect it seems to have on the body. Some homeopathic remedies are so diluted that not even a single molecule of the active agent remains in a solution, yet homeopaths maintain it still works. Also, homeopathy puts an emphasis on analyzing symptoms and then applying remedies to these symptoms, rather than working by classifying diseases. Thus, some people with the same disease may require different homeopathic medicines and treatments. Furthermore, conventional medicine strive to find out how physicians work in the body before they use them; homeopathy is less concerned with the intricate biochemistry involved than with whether a remedy ultimately works and heals holistically. For all these reasons, conventional medicine claims that homeopathy is not scientific, while homeopaths are quick to reply that homeopathy has been scientifically developed and studied for centuries with much documentation and success. A 2002 pediatric journal article reported on a study that showed some individualized homeopathic remedies eased the symptoms of uncomplicated acute otitis media (ear infections) in children. While the authors admitted more research was needed, they said the positive results justified further study on homeopathic remedies for childhood ear infections. To date, it has accredited five institutions: Bastyr University of Natural Health Sciences in Seattle, Washington; Ontario College of Naturopathic Medicine in Toronto; Hahnemann Medical Clinic in Albany, California; the National College of Naturopathic Medicine in Portland, Oregon; and the International Foundation for Homeopathy, also in Seattle. Other well-known training programs include the Pacific Academy of Homeopathic Medicine in Berkeley, California, and the New England School of Homeopathy in Amherst, Massachusetts.